Vegan Comfort Classics: 101 Recipes to Feed Your Face is a BESTSELLER! The week of release it was the #1 selling cookbook in America according to Nielsen BookScan, ranked in the Top 100 overall books on Amazon.com, and ranked #3 on the Globe and Mail Best Sellers List in Canada. so what's in this book anyway? 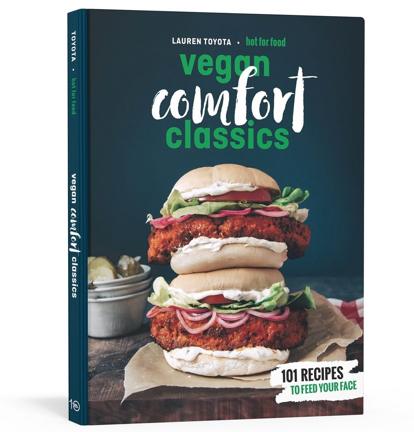 Lauren's Hot for Food Vegan Comfort Classics provides so many wildly indulgent comfort food recipes--like Mac & Cheese Onion Rings and Stuffed Crust Pizza--all without a lick of animal products! I'm willing to bet there's something in here to tempt even the biggest plant-based skeptic. Lauren has absolutely nailed this cookbook. Vegans looking to up their cooking game, or those hoping to try plant-based eating for the first time will be blown away at the creativity of these recipes. From basic sauces and doughs to the most delicious-looking veggie burgers and cakes, this book has it all. The photos and recipes don't disappoint! No matter where you fall on the plant-based spectrum, Lauren's creations will immediately appeal to that side of you that craves crispy fried goodness, a sticky-gooey sugar hit, an unabashedly large and delicious serving of carbs, or just something that reminds you of bacon. And we all have that side! Lauren is a genius when it comes to plant-based cooking. Who would have ever thought that recipes like French Toast Coffee Cake, Mac & Cheese Onion Rings, and Stuffed Crust Pizza would be in a vegan cookbook! Hot for Food has become my favorite YouTube channel and I'm so excited to cook everything from Lauren's book. Lauren is a renegade and hugely responsible for showing the world how incredible plant-based foods can be. Her dedication and out-of-the-box brilliance for vegan cooking is in a league of its own. Good luck eating any other vegan food after you try hot for food recipes, because it just does not get any tastier than this. This is basically a bible. Lauren Toyota is above the law. In this excellent book of hearty, bold recipes, Toyota makes good on her promise to offer “indulgent, not pious” vegan fare. I’m not vegan, and I do eat meat, but I rarely cook it at home. So I’m very, very excited to dive into this new vegan cookbook that is brimming with hearty meals that are vegan, but 100% comforting and satisfying. The hardest part is choosing which recipe to make first. Maybe The Best Vegan Ramen? Or Raspberry Funfetti Pop Tarts! In Vegan Comfort Classics: 101 Recipes to Feed Your Face the YouTube superstar Lauren Toyota fends off skeptics with a lineup of indulgent-by-any-standards classics: Southern fried cauliflower, sweet potato gnocchi, spicy peanut noodles, fudgy brownies, apple fritters. She understands better than anyone that multiple layers of flavor and texture are crucial when you’re not allowed to fall back on butter and bacon fat. This book is beautiful. It’s filled with mouthwatering photos of over-the-top dishes. Every dish looks like it was made to be showed off on Instagram. Just like in her videos, Toyota keeps her book casual and conversational, with chapters like “Badass Brunches,” “Oodles of Noodles” and “Get Saucy.” This ain’t your crunchy granola-filled hippy dippy vegan cookbook. Lauren Toyota’s vegan bacon mac and cheese will blow you away! Thought being vegan was just about eating salads, quinoa and acai bowls? Were you dreading giving up your hangover cures of greasy fry ups and cheese-loaded burgers? Think again. 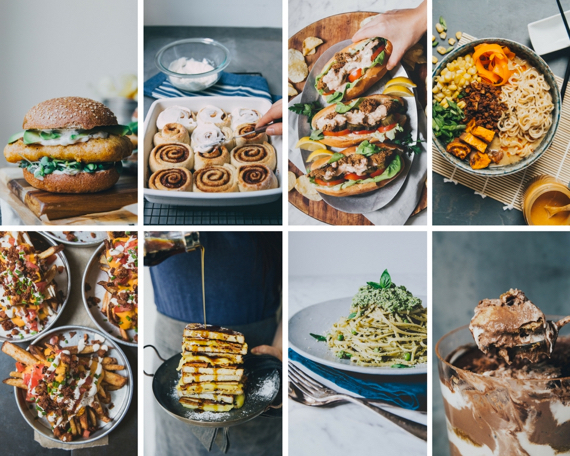 Lauren Toyota of Hot for Food, offers indulgent recipes for comforting, vegan classics such as herb-loaded sausage rolls, courgette-onion bhajis, fudge brownies and waffle-topped cottage pies. With enough suggestions to make any mealtime epic, share with friends or keep all to yourself. 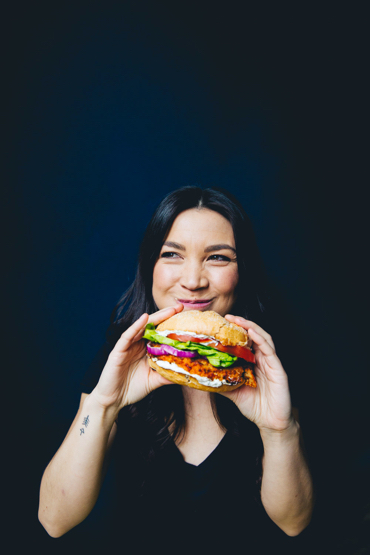 Lauren Toyota is a former MuchMusic VJ and MTV Canada host and a YouTube sensation. Her channel and blog, hot for food, attract a wide and engaged audience of young people curious about how to make vegan food fast and fun. She lives in Toronto, Canada.